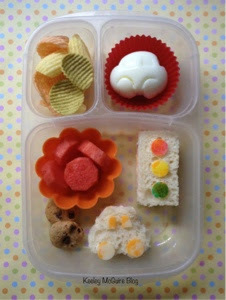 Using our car egg mold as inspiration, I made s a fun transportation lunch for Wednesday. Little Miss has a lot of automobile themed fun in her EasyLunchBoxes container. As mentioned above, inspiration came from our car egg mold which was used to make her car shaped hard boiled egg in the upper right compartment. I used the backside of the mold to imprint her sandwich and cut out a small car shaped sandwich to match, in the main compartment. Cheese makes the wheels and windows. I then used the rest of her Udi's bread slices to make another small sandwich, rectangular shaped, to make a stoplight. I colored cheese circles red, yellow, & green with our food safe markers. In a silicone cup, I cut watermelon bites into stop sign shapes (*shh* they're hexagons, not octagons. It's hard cutting such small pieces of watermelon by hand into octagons, so I settled with six sides - LOL). The main compartment is completed by two mini crunch chocolate chip HomeFree cookies for dessert. The upper left compartment plays on the red, yellow, and green stoplight colors by means of VeggieChips. I need your help friends! I was nominated for Top 25 Foodies Moms of 2012 and I'm dangling out there around 32..33.. in the standings! I need your votes!! You can vote daily ~ No registration or signing up. Just 30 seconds of your time!! Help Keeley McGuire Blog reach the Top 25! SO CUTE!!! I give you credit for even making hexagons. I may have just gone with circles and called them red lights. LOL!